From watching the young cast of the Harry Potter films, one would be forgiven for not thinking it would be Dudley Dursley who would emerge with the greatest theatrical kudos but it is indeed Harry Melling who made the most interesting choices, been part of some fascinating productions, and now sees his debut as a playwright with peddling. He is of course a member of the Troughton acting dynasty so his success is perhaps not entirely unsurprising but with this one man show, in which he also stars, he ensures that any reputation is most definitely merited. The world he has created is London at its seediest. 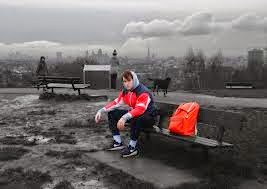 Melling’s nameless 19 year-old ‘Boy’ may wear a London 2012 rucksack but it is dirtied and torn, a reflection of his position in life as a part of a gang of pedlar boys, owned and pimped out by the unscrupulous Bossman to sell any old tat door to door in the city. We meet him as he wakes up to the aftermath of a heavy night, trying to reconstruct what has happened and finding that the only way to do that is to delve as deep as he can into his memory, unearthing harsh realities and difficult truths. peddling is fantastically, almost unbearably intense, and something remarkably thrilling to watch. Contained within a gauze-covered, detritus-filled box around which we all sit (Lily Arnold’s design, Azusa Ono’s brilliant lighting), Melling prowls and pants and prances and peddles in a breath-taking performance. The inarticulacy of this abandoned boy is expressed in an almost poetic style, jagged phrases, shards of memory, flashes of real insight all come and go as the events of the past few days are related, filling in the gaps of a most tragic personal history. And top of that is a portrait of a city that pulls no punches in how it examines where society is right now. The old folk just grateful for someone to talk to, the liberal do-gooders desperate to assuage their guilt somehow, the families wrapping their children in cotton wool from the real life intruding into their gated communities, the shameful neglect of rows of mansions bought up by millionaires and left to rot whilst the vast majority are blighted by housing shortages. It’s a bleak worldview but utterly compelling and convincing in its frankness.